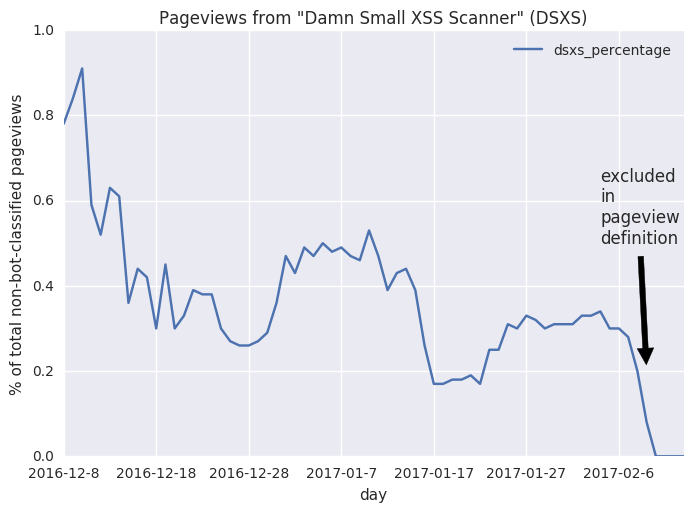 In T153699, it was found that this automated tool (https://github.com/stamparm/DSXS ) generated a lot of artificial pageviews. Looking at more recent times and all projects, it was up to 0.91% of our total "human" (agent_type = 'user') pageviews in December, between 0.37-0.63% on January 6, and still between 0.2-0.4% on February 6. • Tbayer added a parent task: T138207: [Open question] Improve bot identification at scale. JAllemandou added subscribers: Amire80, JAllemandou, Nuria, kerberizer. PS, to record this here as a small footnote: I also double-checked and confirmed that these undetected bot requests happened on desktop only.